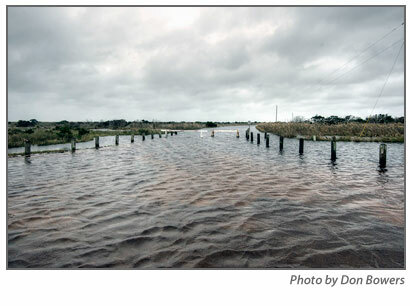 Most visitors’ facilities and ramps on the Cape Hatteras National Seashore remained closed today, and, for the most part, the beaches were inaccessible — even to pedestrians at times of high tide. Two weeks of coastal storms with torrential rainfall, persistent and gusty onshore winds, and large, powerful waves have taken their toll on the beaches. Campgrounds, visitor centers, and lighthouses on Hatteras and Ocracoke remained closed because of flooding. The exception was Bodie Island, where the Visitor Center and Campground were opened today, though the lighthouse was not. In Buxton, most of the Park Service areas were closed — including parking areas, the lighthouse and Visitor Center, Cape Point Campground, and the road to ramps 43, 44, and 45. The closures, especially until today, left some folks grumbling about seashore managers, but Superintendent David Hallac says they were necessary for public safety. “It’s a public safety issue,” Hallac said in an interview, adding the areas had been left open as long as possible and closed incrementally over several days’ time. “The water is deep. We don’t want vehicles stalling out. We don’t want people getting injured or their vehicles being swept away in areas where they are used to parking,” he said. At times, Hallac said, the large waves were breaking right at the parking lot at the site of the old lighthouse, a popular place for surfers and kiteboarders and wave and people watching. Hatteras District Ranger Joe Darling took Island Free Press photographer Don Bowers on a tour of the Lighthouse-Cape Point area today. The two drove part of the way and hiked the rest of the way in waders. The floodwater was just about to the top of Darling’s hip waders on the ocean side of Ramp 44, though the ramp itself was built up several years ago and is high and dry. Though the two didn’t encounter any serpents today, Darling said he’s seen quite a few cottonmouths in the floodwater over the past several days. Today, many visitors were parking along the sides of the road and walking and biking to the lighthouse and the beach, Darling said. He urged them to be cautious. “We’ll be opening the areas as soon as possible,” Hallac promised. He said rangers would be constantly assessing and opening up facilities and ramps as they can. Hallac is hopeful that the flooding will recede over the next few days and before the holiday weekend. However, the Ramp 44-campground area could be problematic. Environmental regulations prohibit seashore managers from draining the area, as they once did. Damage to the seashore during the storm, Hallac said, was minor and largely limited to leaking roofs and problems with septic systems. The septic system in the employee housing in Buxton failed, causing the park to relocate many seasonal rangers who were living there. Some dunes, he said, were also damaged, especially on Ocracoke, where 340 feet of the dune line was flattened by the pounding surf. The dune was wiped out at the Ramp 43 parking area, and there were minor dune breaches in Hatteras village, Buxton, and Pea Island. Fortunately, Hallac said, almost all sea turtles nests had hatched before the two weeks of pounding waves and tidal flooding. The seashore had a record number of turtle nests this year — 289 of them. Hallac said there were only 34 left to hatch when the stormy weather started two weeks ago. After the first week, seashore staff member found eight of 23 nests on Hatteras Island that were still viable. No nest monitoring has been possible since, but resource personnel will be checking the remaining nests as soon as they can. Click here to see a slide show of the flooding in the Buxton Park Service areas.